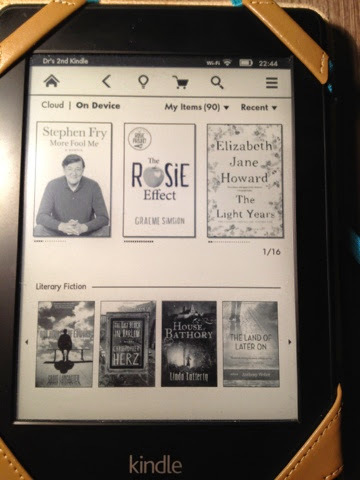 Another good month on the reading front. I finished the first of the Cazalet series and loved it, Whats not to like about real family drama. I'm planning to download the rest but I'm going to have a rest from them in November. I found out there was a sequel to a book I read (and loved) earlier in the year, The Rosie Project. I read about in the comments of someone else's a year in books post...but I can't remember where and now can't find it!! Anyway, 'The Rosie Effect' was my second book of October. I really enjoyed this book too, although it felt more rushed than the first book. I read an interview with Graeme Simsion who said the first book took him more than a year to perfect and get Don's voice right and the second book came much more quickly. In some ways it showed. There were some really good moments in this book but I found Rosie's character a little stilted (and not the woman she was in the first novel which can't just be explained away by her pregnancy) and the plot a little more obvious. In some ways this shouldn't be a great surprise we know the formula for this sort of story. In spite of these actually very minor complaints, I'll be reading the third book which is surely going to happen. I'm still reading Stephen Fry's autobiography. It's a little (a lot) self indulgent and although I usually find his writing style fluent and very readable, I'm just not into it this month. I'll be continuing with this in November. Also in November I'll be reading "We Are All Completely Beside Ourselves" Karen Joy Fowler. I haven't read The Rosie Project yet, but know that many of my students love it. As for the sequel, I've heard exactly the same criticism from others. I recently read Tender to the Bone, by Ruth Reichl (a food autobiography) and I was totally disappointed by the self-absorbedness of it (particularly the "poor me" element got to be really annoying.) A pity really, isn't it. I haven't read any of these but I always enjoy seeing what others are reading so I can get some ideas. I love biographies and autobiographies; I think they're what I read most these days. The Cazalet series is wonderful, I do understand you wanting to take a break between books tho'! That is the second mention of the Karen Joy Fowler book maybe I need to check it out.......enjoy your reading.